Our forklift tyre range covers solid, pneumatic & press-on-band tyres in all common sizes in leading brands like Camso Solideal, Trelleborg, BKT & Continental. Simply search our catalogue & buy online! For assistance please call us on 01159 940 900, or alternatively live chat or message us & we will be glad to help! How Do I Read My Forklift Tyre Size? The first number is the width (section width) of the tyre in inches. The last number is the rim (diameter of the hole in the middle of the tyre) in inches that the tyre fits onto. So a 6.00-9 is 6 inches wide, and fits on a 9 inch rim (has a 9" hole in the centre of the tyre). The tyre construction isn't specified but it will be either Solid (solid rubber) or Pneumatic (air filled). In our tyre finder select construction as SOLID for solid tyres, or as CROSSPLY for pneumatic air filled tyres. Similar to the above but there is no decimal point in the first number. Again, the first number is the width (section width) of the tyre but this time in millimetres not in inches. The last number is the rim (diameter of the hole in the middle of the tyre) in inches that the tyre fits onto. So a 300-15 is about 300mm wide, and fits on a 15 inch rim (has a 15" hole in the centre of the tyre). The tyre construction isn't specified but it will be either Solid (solid rubber) or Pneumatic (air filled). In our tyre finder select construction as SOLID for solid tyres, or as CROSSPLY for pneumatic air filled tyres. The first number is the height of the tyre (called the outer diameter) in inches. The second number is the width (called section width) of the tyre in inches. The last number is the rim size in inches that the tyre fits onto. So a 23X9.00-10 is 23 inches tall, 9 inches wide, and fits on a 10 inch wheel rim. The tyre construction isn't specified but it will be either Solid (solid rubber) or Pneumatic (air filled). In our tyre finder select construction as SOLID for solid tyres, or as CROSSPLY for pneumatic air filled tyres. The first number is the width (section width) of the tyre in millimetres. The second number is the profile, and the last number is the rim in inches that the tyre fits onto. So a 250/75-12 is 250 mm wide, has a profile of 75%, and fits on to a 12 inch wheel rim. The tyre construction isn't specified but it will be either Solid (solid rubber) or Pneumatic (air filled). 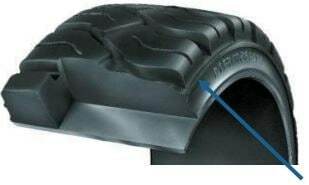 In our tyre finder select construction as SOLID for solid tyres, or as CROSSPLY for pneumatic air filled tyres. This size marking is commonly seen on 'press-on-band' style forklift tyres. The first number is the height of the tyre (called the out diameter) in millimetres. The second number is the width (called section width) of the tyre in millimetres. The last number is the rim in millimetres that the tyre fits onto. So a 405X130X305 is about 405mm tall, 130mm wide, and fits on to a 170mm wheel rim. The construction will almost always be solid rubber (not air filled) as this size marking is usually always for solid rubber or polyurethane press on band tyres. What Are Forklift Tyre Speed and Load Indexes? What Types of Forktruck Tyre are There? The most commonly used tyre type is solid tyres, sometimes known as solid resilient tyres. These look like normal tyres but are made of solid rubber material so are not inflated/air filled like pneumatic tyres. They are therefore puncture proof and wear very well extending the tyres life span. 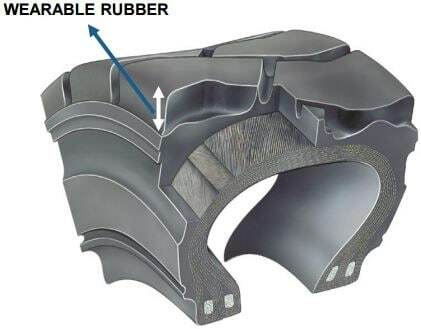 The inner section of solid tyres is usually a soft compound, which gives some cushioning/suspension (to help with ride quality), with an outer layer on top made of rubber. To fit solid tyres to your forklift you normally require a special tyre press, and often the tyre fitting takes place on site by a specialist mobile tyre fitter who bring the press with them. There are two different fixing methods for solid tyres, Standard Fit and EasyFit. These are dependent on the trucks make, model and age. Pneumatic air filled tyres are normally fitted to larger machines and side loaders, often because pneumatic tyres giving much more cushioning/suspension than solid tyres would. Pneumatic tyres are air filled like normal car tyres for example, and often require an inner tube and tyre flap to keep them inflated. Some manufacturers supply the tyre, inner tube and a flap in a 'set' as standard. Some of the larger tyre sizes have to be pneumatic as a solid tyre would simply be too heavy for the machine to move. Press-on-bands are a solid band of rubber that is bonded to a steel band. Press on bands are normally fitted to machines that only work in areas with smooth floors. They are not very thick and so have very poor cushioning/suspension properties. Again a special tyre press is required to fit these tyres. The process involves a new tyre being pressed onto the wheel, where the inner steel band stretches over the wheel. This tight fit holds the band in place. Finally on warehouse equipment there are bonded tyres. These usually have a polyurethane or rubber tyre bonded to the wheel. Replacement of the tyre usually requires the whole wheel being changed. What is the Difference Between Pneumatic & Solid Forklift Tyres? Forktruck tyres can be solid or pneumatic, with each type being suitable for certain tasks. Solid tyres, as the name suggests, are not air filled, but are solid bands of molded rubber or a strong polymer, and are fitted to the wheel rim using a hydraulic tyre press to press them onto the rim. Solid tyres offer unmatched durability and a stable platform for Forklifts and Telehandlers, and are an excellent choice for a warehouse environment where vibration is not a concern. Solid tyres also cannot be punctured, making them suitable for hazardous environments. Pneumatic tyres on the other hand are air-filled, and may have an inner-tube and/or flap, or sometimes may be tubeless for high-speed performance. Pneumatic tyres are available in a greater range of tread patterns and sizes and offer a more comfortable ride, minimising the stress/vibration applied to the machine and its driver. Pneumatic tyres are vulnerable to punctures however. and wear out quicker than Solid tyres. A frequently asked question is 'How long do solid tyres last compared to pneumatic tyres?'. Depending on usage, a solid tyre will normally outlast a pneumatic tyre. Usually you would go through 2-3 sets of air tyres (pneumatic) to 1 set of solid tyres. Solid Forklift tyres can have two fitting types: Standard Fit and Quick Fit. You need to order the correct fitment and this depends on the wheel rims your forktruck has. Standard fitment tyres are used on vehicles with split-rims, that often bolt together with a locking ring and flange. Quick Fit tyres however fit on one piece or multi-piece rims that do not have a lock ring, flange or advance band. When ordering Forklift tyres it is important to ensure that you order the correct fitment for your vehicle else the tyres could not fit the rim! This information will be available from your Forktruck manufacturer, or if you give us the machine make, model and year on ordering, we will try to check which fitment is usually used. Quick Fit tyres are sometimes known by other names depending on the forklift and tyre manufacturer. These names include Easy Fit, Lip Fit, Click Fit, Limpet Fit and more. Buying Forktruck tyres online might be new to some people, but it makes a lot of sense. Traditionally tyres are bought from your local tyre supplier in your area, which means you are relying on their stock, pricing, expertise and customer service. By using Big Tyres (a Nottingham based UK company) you're using a national tyre supplier, whose only business is in supplying tyres, tubes, wheels and fitting. We have key accounts with main manufactures to offer you the best prices, carry millions of pounds worth of stock, can access any Forklift tyre not in stock by going direct to access manufactures stock, are up to date with all the new tyre news regarding brands, patterns and offers in the market place, and have a dedicated team of customer service staff. We often provide free shipping and next day delivery and are open to talk with you by phone, email or live chat. Mobile on-site fitting for forklift tyres is available for Camso Solideal, Trelleborg & Continental branded tyres. A certified & insured fitter will come to your site within 2-4 working days to fit your tyres for you. Ask us for a fitting quote as it depends on the size, but typically the on-site callout fee is £30 + VAT, and tyre fitting is between £10-25 + VAT per tyre (depends on size), and tyre disposal if required is £10 + VAT per tyre. If you order fitting with your tyre a fitter will come to you and bring the tyres with them, so you won't need to wait in for a separate tyre delivery. In order to book fitting we would need to know the machine make, model and ideally the year of manufacture of the forklift truck you have. If there are multiple trucks on site then a serial number or fleet number would also help. For more information read our Forklift Tyre Fitting information page. When Should I Replace Forklift Tyres? Solid Resilient tyres can be worn down to the 60-J line as indicated on the sidewall of the tyre. Wearing beyond the 60-J line represents a safety hazard and can lead to unexpected tyre failure as well as potential damage to the forklift. The 60-J line is shown by the red line on the image. 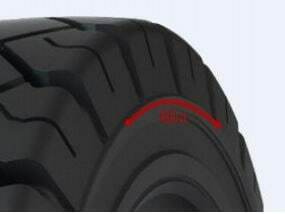 Pneumatic tyres can be worn until the tread pattern has been worn away, just like car and truck tyres. Wearing beyond the tread pattern represents a safety hazard and can lead to unexpected tyre failure as well as potential damage to the forklift. Smooth Pattern - Most manufacturers say to replace a smooth press-on tyre when the overall rubber height reaches 2/3rds of the original rubber height. Traction Pattern - Similar to a solid tyre, a traction tyre has a safety line, indicating the tread is gone and the tyre should be replaced (See Image). There are a lot of forktruck manufacturers in the market place. You may have a machine that has been built by Advanced Handling, Atlet, Ausa, Battioni & Pagani, Baumann, Boss, Bowman, BT Rolatruc, Cesab, Clark, Combilift, Commander, Crown, Dambach, Doosan, Drexel, Fantuzzi, Filco, Halla, Hamech, Hyster, ICEM, Irion, Jungheinrich, Kalmar, Kentruck Ab, Komatsu, Kramer, Lansing Linde, Linde, Logitrans, Lugli, Manitou, Mariotti, Mast, Moffett, New Hunslet, Nexen, Nichiyu, Nuova Detas, NYK, OM Pimespo, OMG, Paus, Pucci, Rocla, Samuk, Sichelschmidt, Sidetracker, SMV, Still, Tai Lift, TCM, Translift Bendi, Translift, VKP, Wilmat, Yale, Caterpillar, CVS Ferrari, Jumbo, Mitsubishi, Bradshaw, Hyundai, Daewoo, Nissan, Toyota, or JCB. How Should I Store Forklift Tyres? Storing your Forklift tyres correctly when on the machine or stacked as spares is important in extending their life time and ensuring they remain safe and continue to function as they should. General advice is to keep your Forklift tyres out of heat and direct sunlight, as it can dry out the rubber and cause cracking. For the latest forklift tyre news, advancements and also a little fun, visit our Twitter Page and follow @bigtyres_co_uk or visit and like our Facebook Page. Why not also check our the Big Tyres Blog for educational articles and the latest industry information. We also send out a monthly Big Tyres Newsletter that often has discount codes and news of our latest sales and offers to save you money on your forklift Tyres.